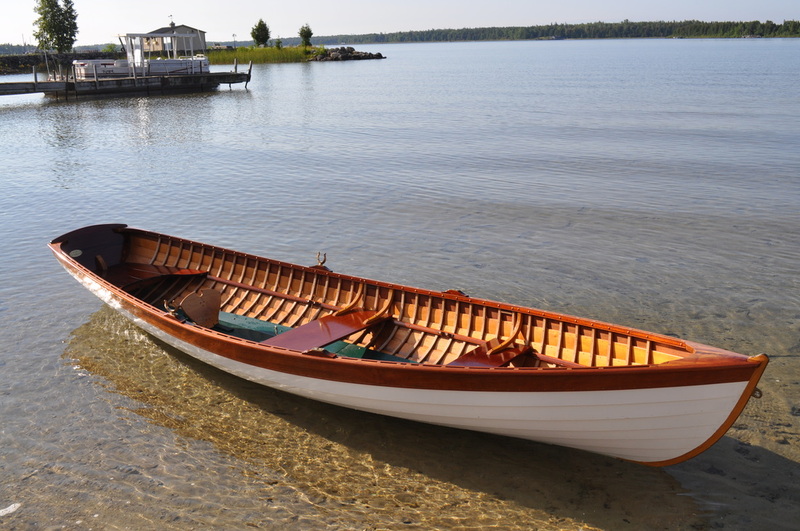 photo sent by Michael M. of his North River Skiff at the family camp, upper Lake Huron. The skiff was built in 1993, yet still looks new. Hitchcock chair edgeband stained and painted. 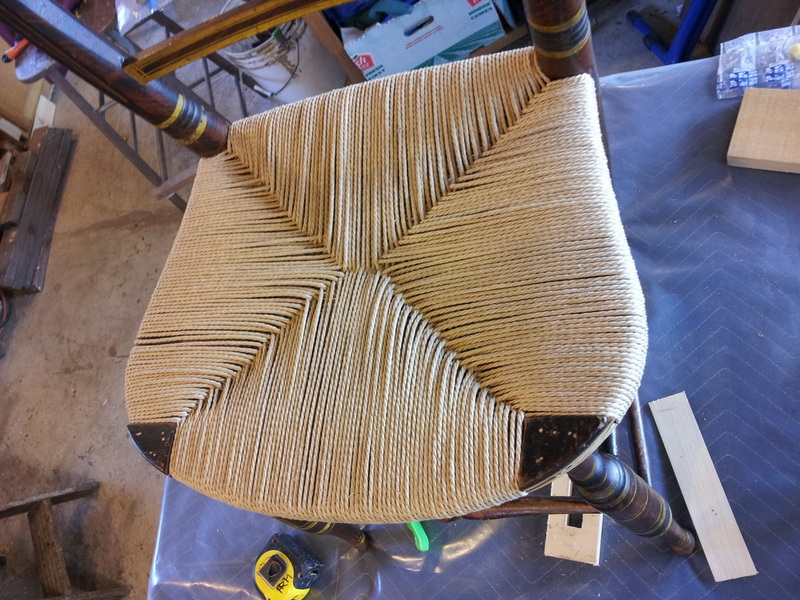 The steam-bent band was easier to finish on the form rather than on the chair. 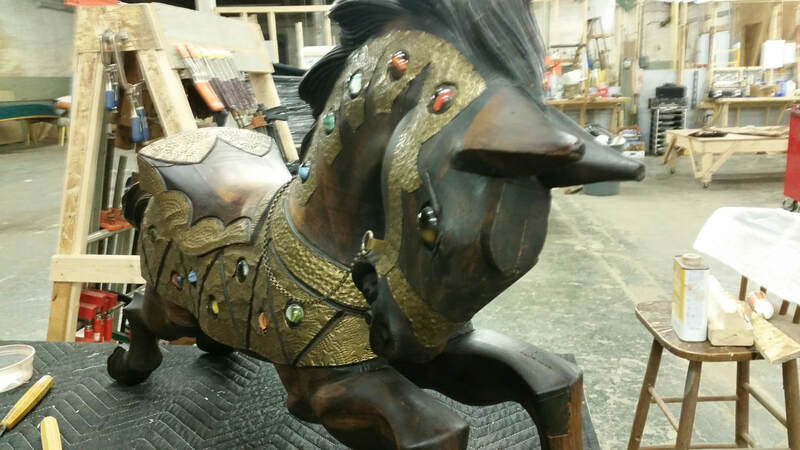 Here it is stained and painted with gold paint to match the original fragmented piece. 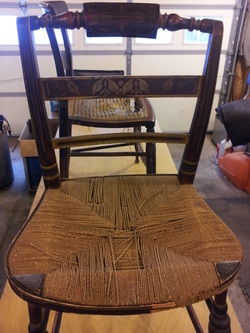 This is one of a set of six woven rush seat chairs I recently restored. 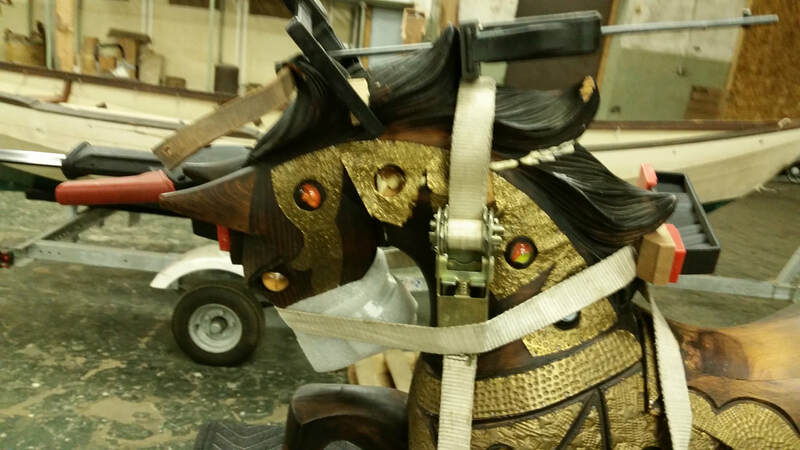 They all needed new rush seats, and varying amounts of wood repair. Most needed partial disassembly and re-gluing. This one had a break through the leg where the seat rails were inserted. This is a weak spot and after many years of use, it gave way. 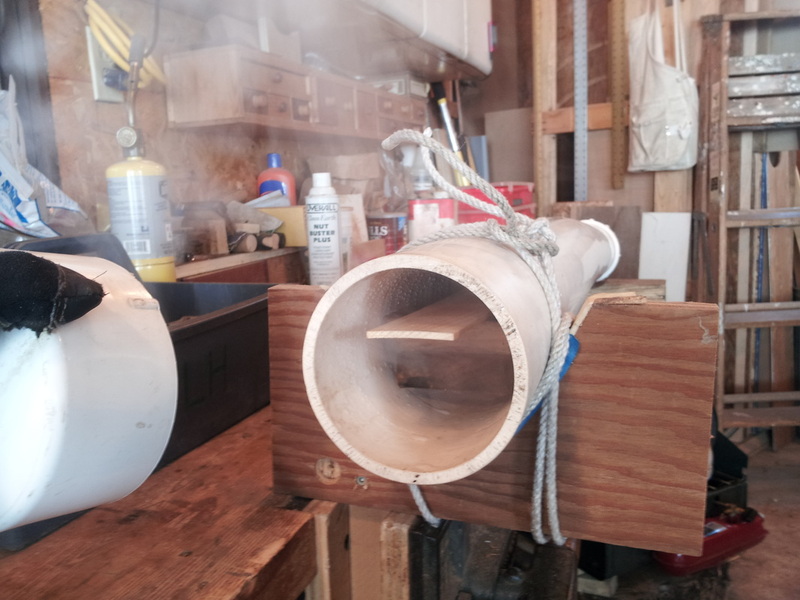 To repair this I inserted both a dowel through the center of the leg, but also let in a piece of maple from a couple inches above the break to several inches below. The completed repair at left. If you look carefully you can see the outline of the piece that was let in to reinforce the leg across the break. Above are the first three chairs after applying shellac to the seats and touching up the finish. They are ready to go home. 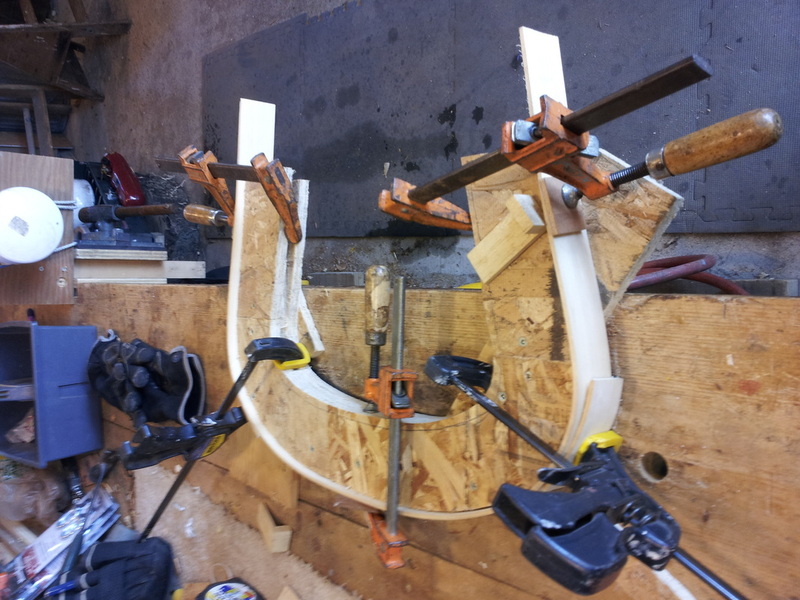 The first step in construction was to build a mock-up of scrap plywood and cardboard which we used to try the angles and scale of the piece in it's future location. 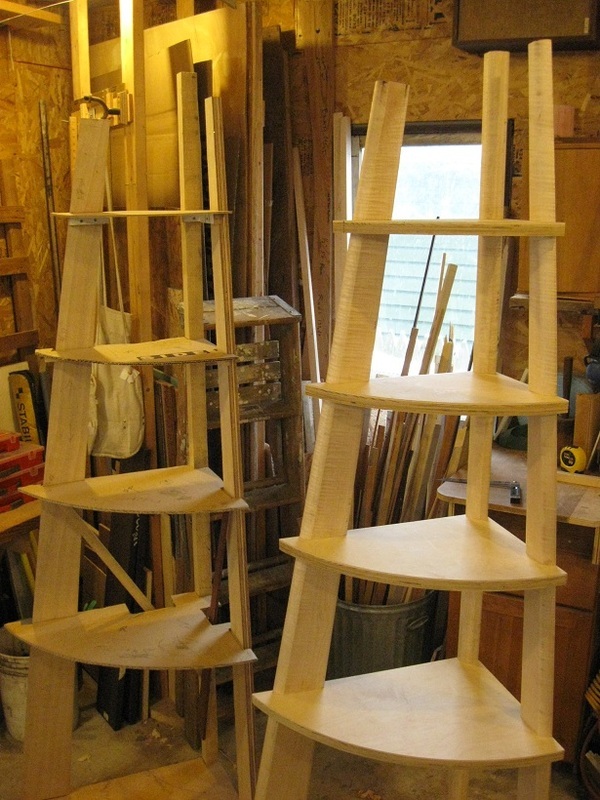 Changes were made to shelf heights and the thickness of the legs was adjusted. Then the model was taken apart and used for patterns of the actual parts. The mock-up, left, is seen next to the actual piece during construction. Below is one of the legs rabbeted for the shelves but not yet dadoed for the wenge strips.